Yes, we do proposal photo sessions. Not every area in the park is good for the proposal. It is difficult to say beforehand, where the most beautiful place at that moment is. If above it’s not too important, the proposal could be anywhere in the park. Surprise proposal – the right moment. We will do a “loveshoot” together. On the right moment (good place, good light, not to many people) I will give you a sign (thumbs up) and you start asking. The Keukenhof is a great place to go. If you love flowers, you can wander around for hours. In 2 months theres will be about 1.4 million visitors. However on most days, you will still have a comfortable walk around the flowers. Come early morning or late afternoon, it’s even better. Everyday you can enjoy and see beautiful flowers. But every week will be different. It all depends on the weather, when the most tulips in the gardens outside will be in bloom. Usually a good time for the tulips outside is to visit the park from second week of April until first week of May. 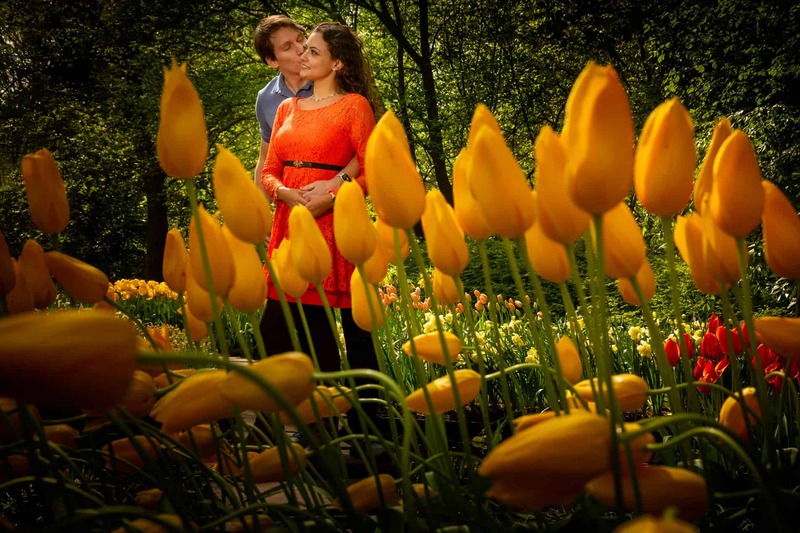 We are a married couple, who loves making photos and walking around in the Keukenhof. We are your guide for the Keukenhof as well. For many years we are used to professionally photograph couples, kids & family. Our style is casual, spontaneous, modern & artistic. Our time walking together will be relaxed. We will show you the best spots on that moment. Of course we will also listen to your wishes. We will make a lot of photos in an easy going way. We will try to make photos without other people in the background. The session will be up to 2 hours.